Tua Tagovailoa turned the Alabama offense into something it hasn’t been in living memory: fun. The true freshman, cannon-armed, fleet-legged quarterback who hadn’t played a snap of football that wasn’t in garbage time came on at halftime against Georgia and utterly transformed the moribund Crimson Tide offense into a powerhouse, leading Bama on four scoring drives and starring in a thrilling 26-23 national championship win. But really, all you need to know for the budding legend of Tua is that last play. There are two sides to this play, equally important. The most obviously egregious is Georgia’s defense, poorly designed, worse executed. Georgia came out in a Cover 2—instantly diagnosed by Tagovailoa, which proved crucial. In a Cover 2, the deep part of the field is divided into halves, with each safety having the responsibility for helping out the corners in their half. It’s a fine scheme for defending underneath, because you’ve got five defenders there clogging things up, but it’s very vulnerable up top. It doesn’t work if the safety doesn’t get over to help. Georgia safety Dominick Sanders did not get over to help CB Malkom Parrish, because of specific mistakes each made. Parrish failed to jam Smith near the line of scrimmage, and this is the most basic conventional wisdom of the Cover 2—the corner has to collide with the receiver, has to force him inside. If a receiver is allowed to run along the outside and run with speed—and Smith is fast—that stretches the safeties potentially wider than they can cover. But Smith was given a unfettered sprint down the boundary, and he left Parrish in his dust. Sanders never came near to getting over, for reasons known only to him. He stayed far too close to the center of the field until the ball was released. Maybe he misjudged Smith’s speed, or his own speed, or Tagovailoa’s arm. 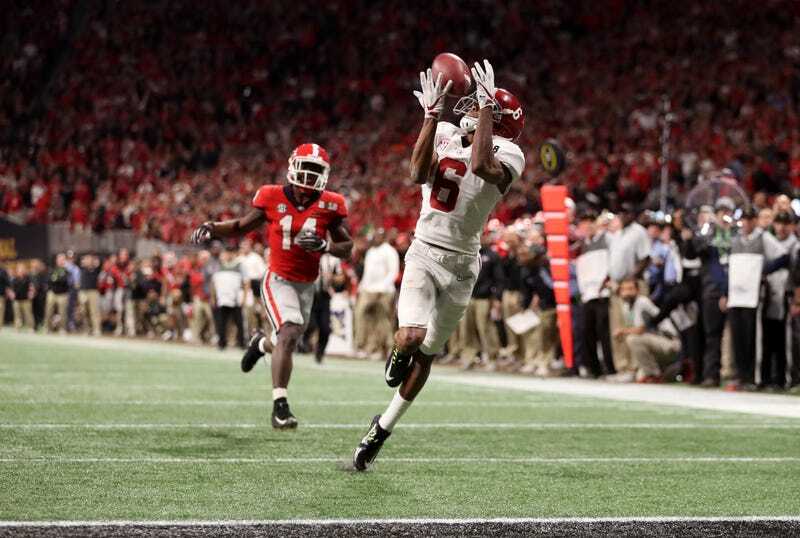 Certainly he was concerned about the deep slants Alabama’s two receivers were running on the right side of the field. But that’s not his responsibility. In the Cover 2, the left side is his, and his alone, and Smith was the only receiver he should have been concerned with. But Sanders was blatantly fooled, and that’s all thanks to Tagovailoa. When the play call came in, Smith was thrilled he’d be running a go route. He let Tagovailoa know he wanted it—“trust me, bro” he told his QB—and Tagovailoa saw the Cover 2, and perfectly looked Sanders off. Watch Tagovailoa’s head in the first, behind-the-offense camera angle in this video. He’s staring down his receivers on the right side. Sanders saw that and tried to cheat, and got caught so badly that he was backpedaling to the right, the wrong direction, in the instant Tagovailoa let the ball go. Sanders never had a chance. Tagovailoa, appearing almost impossibly poised for an 19-year-old, calmly explained what he had seen on that final play and what he did to take advantage of the soft flank presented by the Georgia secondary. It was a perfect marriage of a visible, inexplicable, fatal defensive flaw, and a quarterback prepared and capable to take advantage of it.